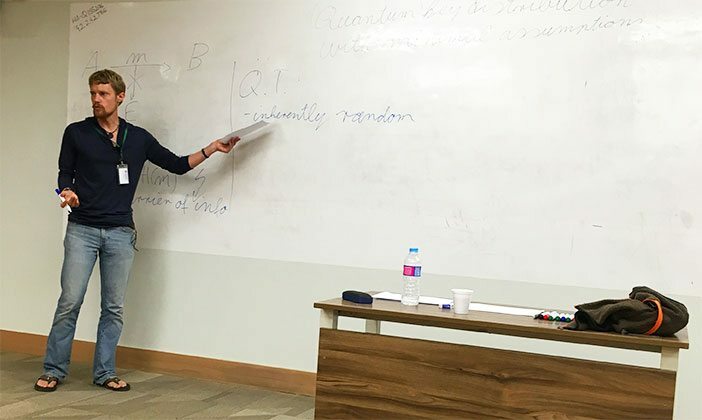 Amin Shiraz Gilani and Syed Affan Aslam, two of the Habib University students that volunteered in organizing the Quantum Information Summer School (QISS) 2016 held on campus, write about their personal experiences during the four-day event. Amin Shiraz Gilani: Being a habitual late comer, I surprised myself on the morning of July 25th by reaching an hour early to attend the Quantum Information Summer School (QISS) 2016, as I was one of the two volunteers assisting HU faculty member, Dr. Jibran Rashid – the organizer of the event. As I sat at the registrations desk welcoming the participants, I was delighted to see their glowing expressions which was almost contagious and promising at the same time for us organizers. Being a student of HU’s School of Science and Engineering (SSE), I was already familiar with Quantum Information, which was a pre-requisite for QISS with an aim to understand the very basics of QI and discover some of the research areas of the field. QISS broadened our horizon of understanding and comprehension even further. Of the speakers, we expected to learn the most from renowned quantum scientist, Dr. Barry Sanders, who delivered his talk on the implementation of quantum computers. Personally, I am more inclined towards the theoretical and mathematical aspects of quantum information and therefore, I found his talk challenging yet understandable. It actually gave an abstract answer to a question I was least concerned about i.e. how to physically build a quantum computer. To acquaint us with the mathematical formalism of QI, Dr. Sabieh Anwar from Lahore University of Management Sciences (LUMS) was invited. Dr. Anwar built his case around the very fundamentals and ended by touching upon the mathematics of some of the finest early results of QI, such as quantum teleportation. His talks took inspiration from quantum mechanics thus depicting its intrinsic connection with QI. I was particularly interested in cryptography and to explore aspects of quantum cryptography by Dr. Benno Salwey – the third speaker at QISS. I had already worked my way through the beginning of Dr. Salwey’s PhD thesis that made me look forward to his talk. Since he had already arrived in Karachi a weekend before the commencement of the conference, with the help of Dr. Rashid I set up a meeting with him during which he told us about his cycling adventure from Germany to China and also answered some of my queries related to his thesis. A week’s worth of discussions and intellectual exchange of thoughts came to an end with the formal closing of QISS 2016. To celebrate its success, a formal banquet was planned on the last day of the conference. During the couple of hours prior to the banquet, I had a very constructive meeting with Dr. Salwey during which I asked him about some particular insights on his thesis and about the field in general. Our discussion continued over the banquet but its theme changed from technical to more experiential, on the lighter side of life as he revealed his urge to explore Pakistan which also led him include Pakistan on his cycling route. When I asked him whether he was afraid of being in a country where the law and order situation is not so strong, he said that he did not see a connection between media’s portrayal and the actual situation. He was convinced that everyone he met here was of a friendly nature and seemed to be at peace. Syed Affan Aslam: Dr. Abuzer Yakaryilmaz, the fourth QISS speaker, was a Turkish native lucky enough to escape the crisis in Turkey surrounding the military coup. His field of specialization was Quantum Automata Theory, which understandably is not everyone’s cup of tea. Having said that, I was intrigued by the content of his presentation (mainly) because of my rudimentary training in the (Classical) Automata Theory, which the other participants were devoid of. An interesting exposure to Probabilistic Finite Automata (PFA) and Quantum Finite Automata (QFA) was something that I was really interested in. It is important to mention that this field is growing and loaded with some important open questions, which Dr. Yakaryilmaz was working on and was ready to share with others enthusiastically. I was also guilty of skipping one of Dr. Sanders’ session for discussing the new dimensions that had been and could be added to Dr. Yakaryilmaz’s emerging field. For a student who wills to pursue theoretical computer science, Dr. Yakaryilmaz was certainly the most valuable asset. Apart from his intellectual endeavors, Dr. Yakaryilmaz was interested to explore the neighborhood where Habib University is situated. For me, it was an opportunity to interact with him as I walked around the neighborhood along with him. I took him to the Thursday Wholesale market which was quite a spectacle for him. Whilst thrusting our way through the crowd, he pondered over my career prospects and gave me some valuable suggestions. Such an amiable hangout with a scientist qua well-wisher may never be unremembered. To read more Blogs by our HU Lions, click here.